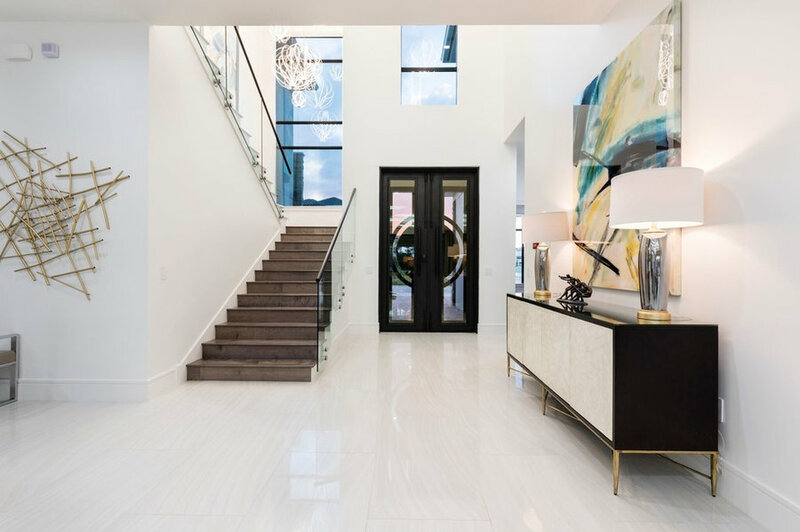 This stupendous two-story foyer makes a dramatic first impression when you enter this lovely modern home. 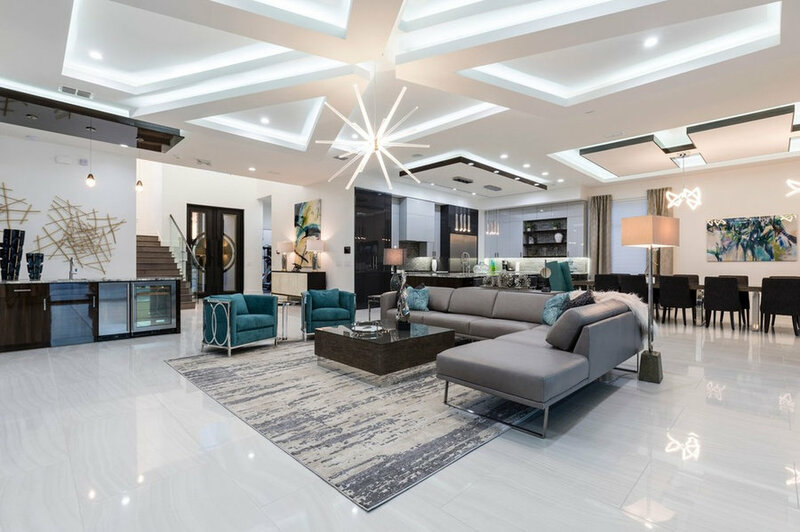 As you make your way into the main living area you can't help but look up. 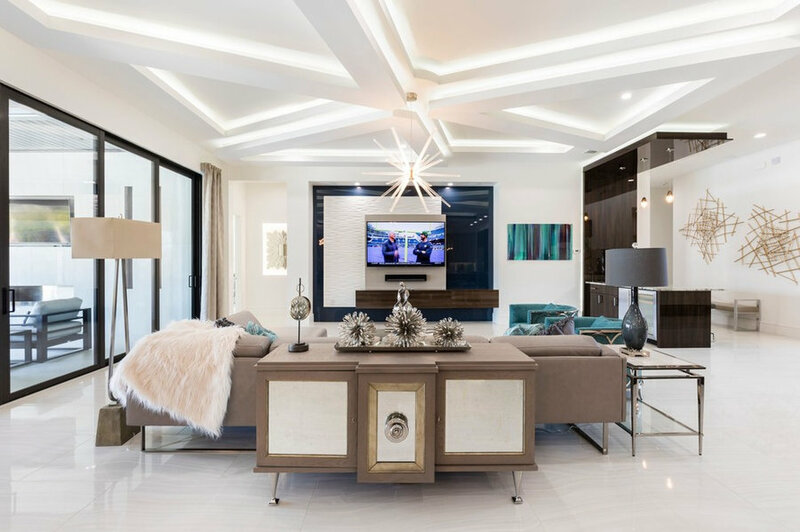 Have your breath taken away by the extraordinary custom ceiling design and contemporary light fixture. 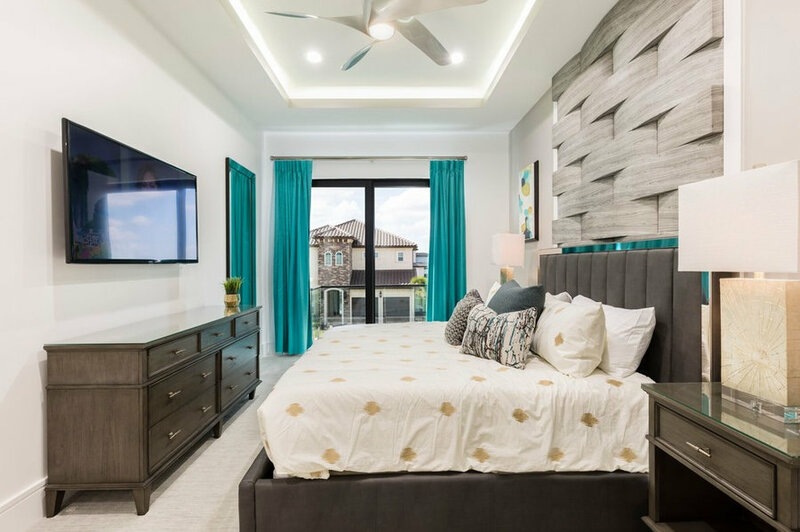 Geometric designs can work wonders in any room – they can trick the eye into height, width, depth and everything in between. 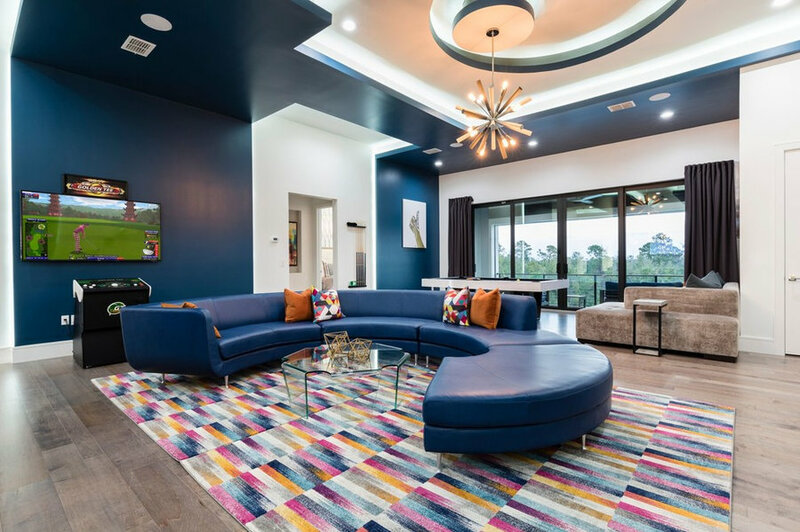 Enjoy this open floor plan full of sleek lines and pops of color in each direction. 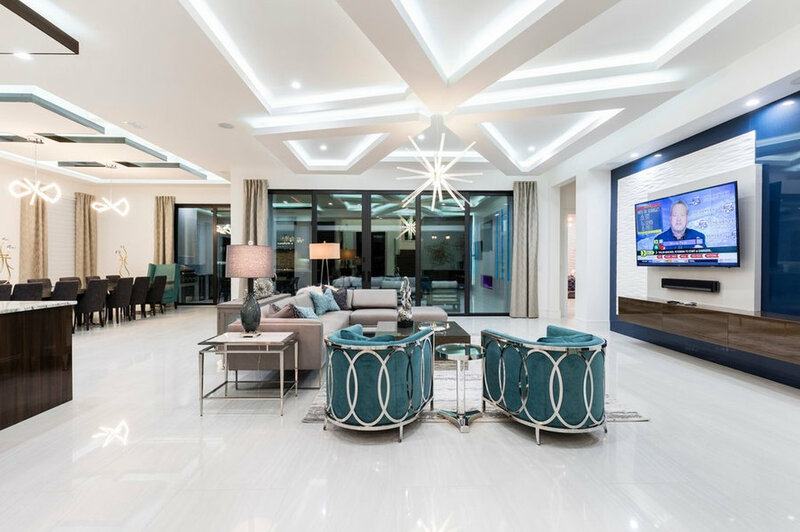 The upstairs living area creates a clear aesthetic vision, with its bold color, form and texture. 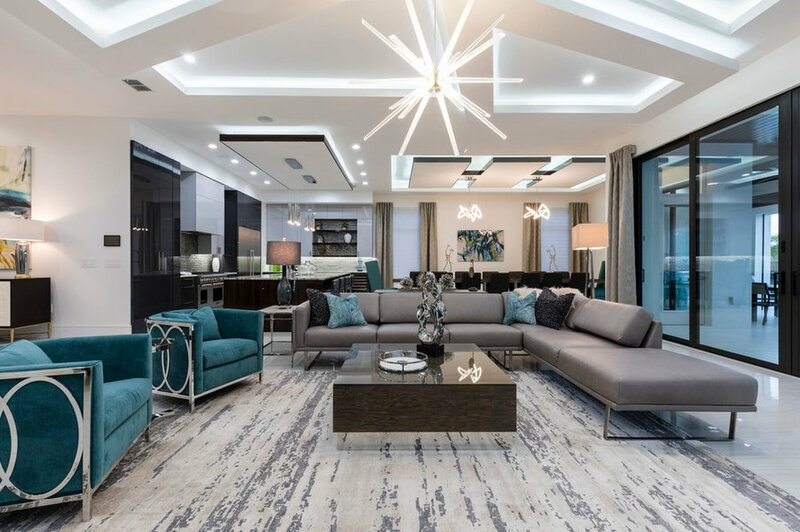 The furnishings and accessories reflect a lifelong passion for art, design and architecture. 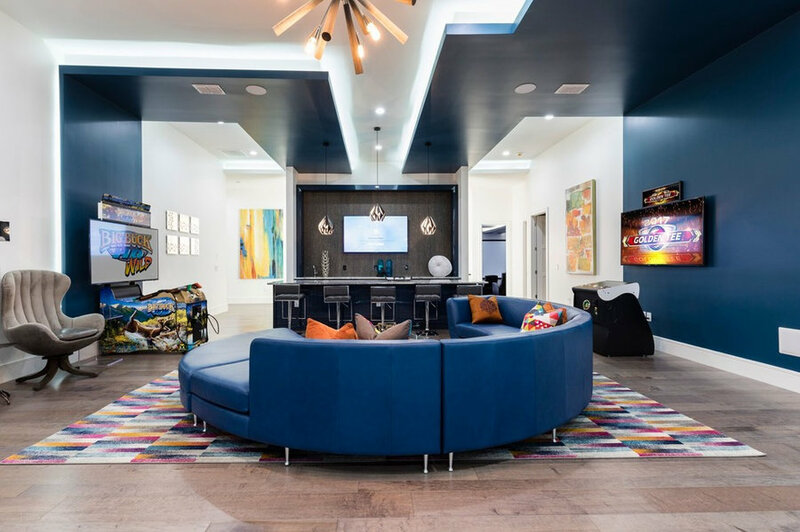 When you're at this all inclusive vacation home in Orlando the fun never stops, immerse yourself with games and themed rooms throughout the house. 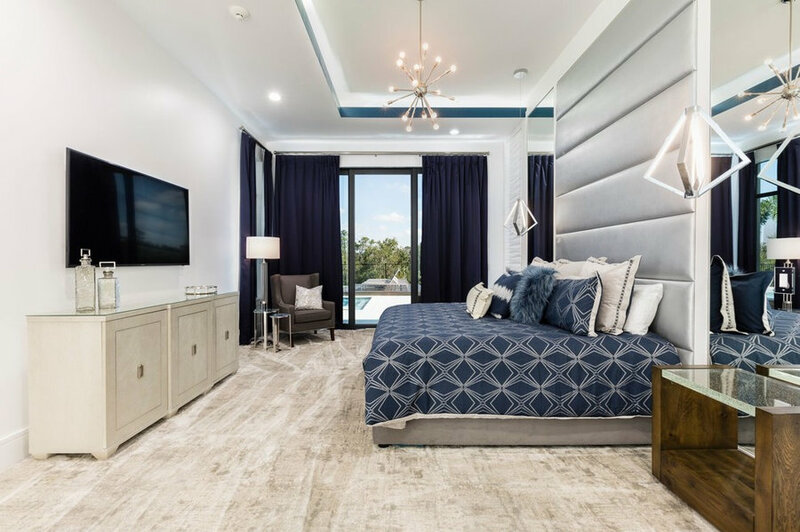 This Master bedroom is infused with navies and a beautiful custom vinyl headboard with led lit trey ceilings to compliment the all over aesthetic. 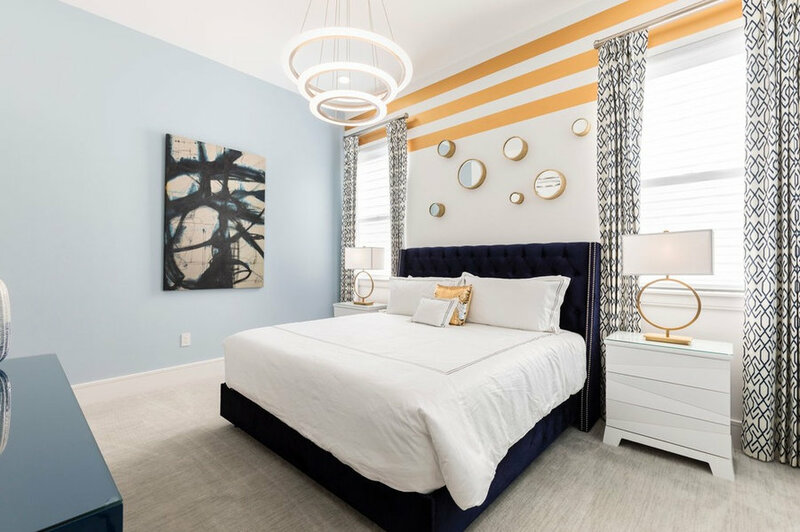 This room screams FUN, it's jam packed with blue and gold accents and is nicknamed the bubble room for obvious reasons. 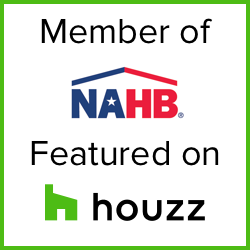 Come to this Orlando vacation home, relax and unwind while enjoying luxurious views all around you. Who's to say sky's the limit? We turn dreams into reality at SNDG! Go ahead, shoot for the stars... we'll make it happen. 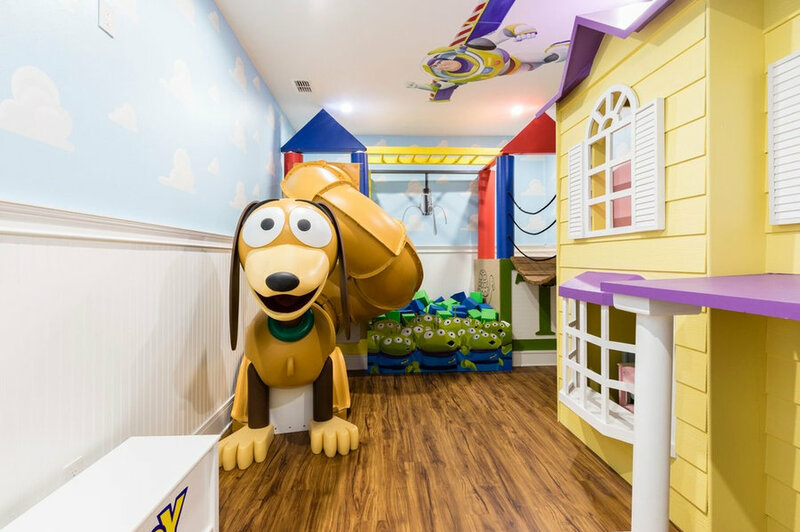 This Toy Story themed kids room is extra special, it includes: a slide, a doll house inside a house, a cube pit, monkey bars, a bridge.. 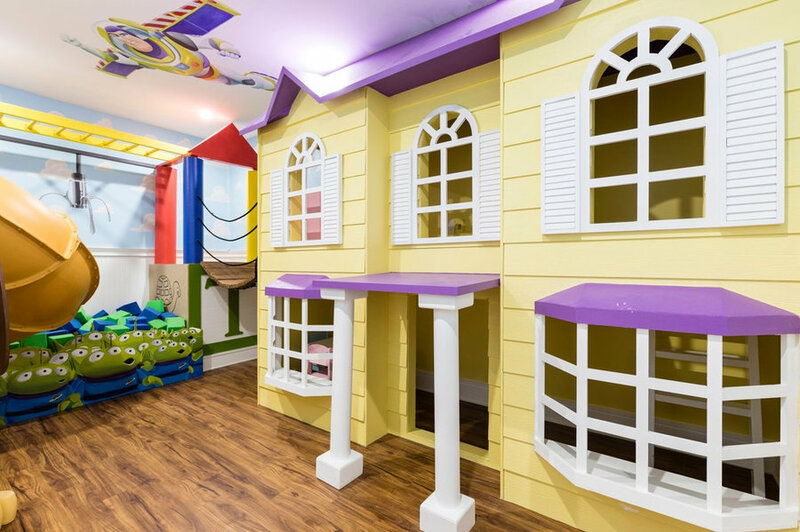 Thinking outside of the box is what we do best! 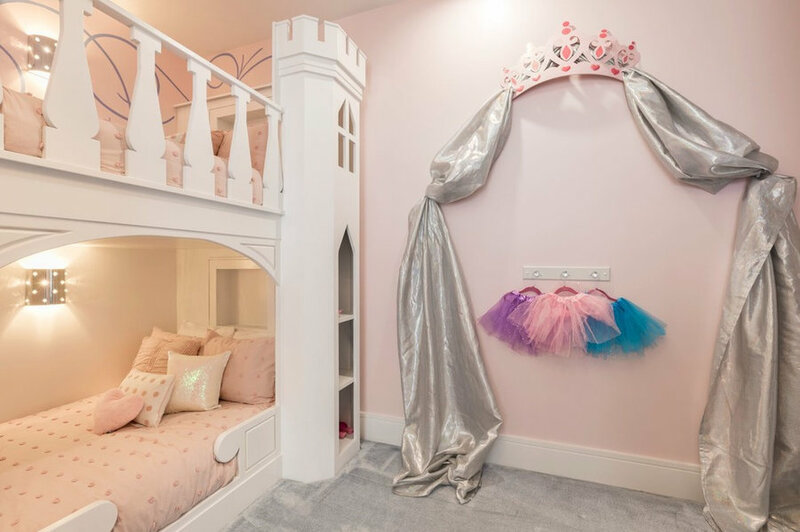 Every little girl deserves to feel like a princess - with a glitter embodied castle as a bed frame and elegant crystals as lights alongside glittery blue carpet to offset the pink. 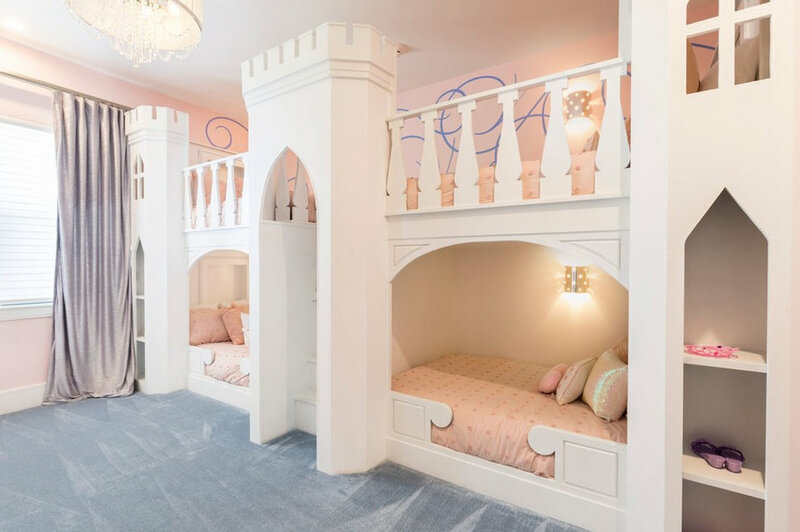 Anyone is guaranteed to feel a sense of wonder and magic when they walk in. 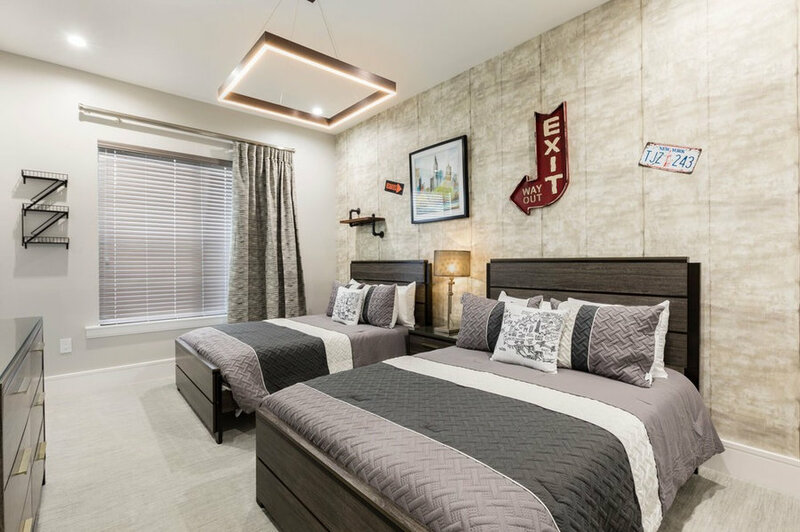 In this NYC themed room we use a concrete like wallpaper to add depth and texture to the space. It ties in both urban and industrial styles to get the Manhattan loft feel. 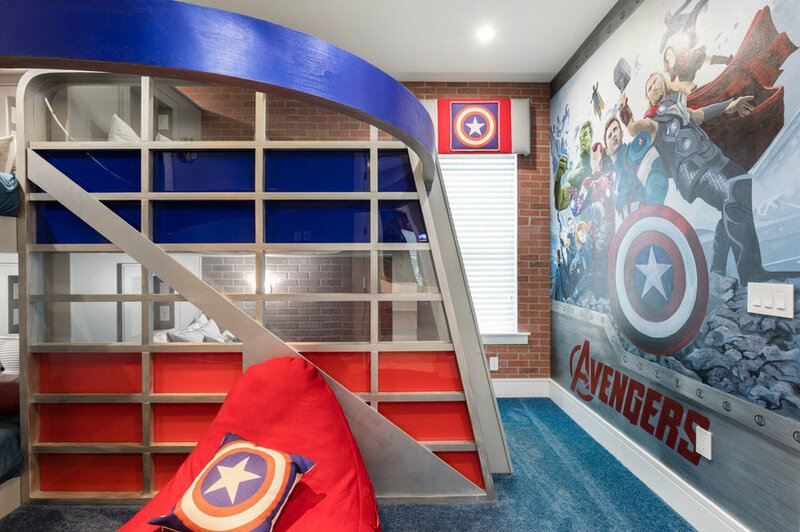 Transform into a superhero when you enter this Marvel Comic themed room. It is immersed with electric blues and bright reds to tie in the Avenger design.